Population: 2,890,000. Metropolitan Area: 8,400,000 Land area: 228 sq. miles. Rainfall: 36 inches per year. Cooling degree days: 940. Heating degree days: 6176. Mayor is elected. City Council consists of 50 Aldermen. Sustainability as a major goal started in 2000. Electricity is provided by the investor-owned ComEd. ComEd is a division of Excelon Corporation. Natural gas is provided by Peoples Energy. Peak load occurs mid-day during the summer. Chicago is a member of the Chicago Climate Exchange. While the city does track its greenhouse gas emissions, it does not trade them, preferring to bank or retire them. Mayor Richard M. Daley’s oft-stated goal is for Chicago to become “the most environmentally friendly city in America.” Encouraging environmental innovation will be beneficial for the health of both the citizens and economy. Conserving natural resources, and encouraging environmentally efficient behavior from citizens and businesses, not only ensures the sustained health of the City but it also makes plain common sense. 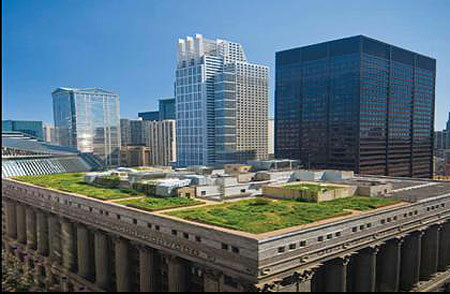 In 2005, Chicago released an 80-page Environmental Action Agenda: Building the Sustainable City. The comprehensive and detailed plan is divided into 17 functional areas – Airports to Waste and Recycling. Conserving, protecting, and restoring natural resources. Each functional area has sections for Mission, Accomplishments, Action Agenda for 2005, and Action Agenda for 2010/2020. Exhibition: Chicago Case will showcase its current and future models through seven themes including water, garbage, food, energy, health, mobiles and commerce. This entry was posted on Thursday, January 28th, 2010 at 11:22 am	and is filed under Urban Best Practice Area (UBPA). You can follow any responses to this entry through the RSS 2.0 feed. Both comments and pings are currently closed.